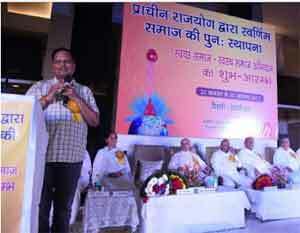 New Delhi: Union Minister of Social Justice and Empowerment Tanwar Chand Gehlot inaugurated a nine-day campaign on ‘Clean Society-Healthy Society’ in a public event organized by the Brahma Kumaris at Radison Blu Hotel, Paschim Vihar, here last evening. This campaign which will be carried out by the Brahma Kumaris organization in different areas of Delhi, Noida, Gurugram, and Faridabad will sensitize the public on inner and outer cleanliness, holistic health and hygiene, de-addiction, social empowerment, moral values and character building. Launching the campaign, Gehlot said that ancient rajyoga and spiritual knowledge provide the foundation of holistic health and cleanliness of mind, body, intellect, and spirit. He said that due to infiltration of impurity and vices into our life, not only our health, harmony, and happiness declined but also there was large scale degradation of in our socio-economic, political, cultural and moral value system. ‘The way out is to resort to our ancient spiritual wisdom, raj-yoga, heritage and value system’, he stressed. Delhi’s Health, Industries, Power and Urban Development Minister Satyendra Jain, who was the chief guest, said that cleanliness is the root of our healthy society. Clean hands can prevent a lot of diseases. Cleanliness of mind, body and soul is required for a healthy lifestyle. A clean and pure mind forms the basis of doing service in the society. One who is committed to service for society and fellow human beings is away from diseases. He urged the gathering to associate commit them to social service. Blessing the occasion, Raj Yogi B K Brijmohan, Addl. Secretary General of the Brahma Kumaris, said that ancient Raj-yoga is a positive and healthy way of thinking and living which can be practiced while performing one’s daily duties. He said that regular and collective practice such easy raj-yoga can restore holistic health, cleanliness, balance, peace, and plenty in human, ecological and social life. Rajyogi B K Amirchand, Vice Chairman of Brahma Kumaris Social Service Wing in his key note address said that since ancient civilization of Bharat was peaceful, pure, prosperous and golden age, the same golden age society can be re-established with the universal practice and applications of spiritual wisdom, raja-yoga meditation, simple, positive and healthy lifestyle. He said that in the modern society, the easiness of life has increased. Man is the best creation of God. Our original nature is love, peace, compassion, happiness, and kindness. In today’s times, we can see there is a transition from our original nature. There is a need in the society to strengthen our value system. We need to imbibe virtues and values systems in our day to day lives. The core objective of Brahma Kumaris institution is trying to bring our ancient culture back into day to day lives.